Besides Technology, one of my favorite things in the world to do is decorate. I am all about a good craft experience. 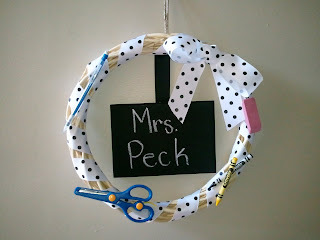 While blog stalking, I ran across a wreath that I just had to make for my classroom door. I hopped on over to Wal-mart for some crayons that were on sale for 40 cents a pack. Then, it was off to Hob Lob for the rest. As I was walking around looking for items to put on my wreath, I found a pamphlet with a picture of a crayon wreath. It was so meant to be! After five boxes of crayons (24 count), a quilting hoop, hot glue, chalkboard paint, a Goodwill picture frame, scrapbooking letter stickers, and some wooden letters I had myself a wreath. I am so in love with it! I can’t wait to put in on my classroom door for this coming school year. I wrote a tutorial for making it on my decorating blog. You can check it out at Creative Carolina Charm if you want. I have been wanting to make a crayon wreath! I love them!!! I will have to check out your tutorial!! I am a new follower and a first year teacher this fall!! I am looking forward to following your blog!! !